The phases of the moon occur because we can see only that part of the moon which reflects the light of the Sun towards us. Stars are celestial bodies that emit light of their own. Our sun is also a star. It is convenient to express distances of stars in light years. Stars appear to move from east to west. 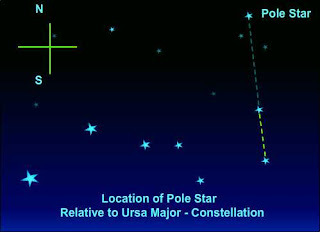 The pole star appears to be stationary from the Earth, because it is situated close to the direction of the axis of rotation of the Earth. 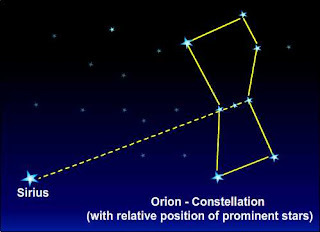 Constellations are groups of stars that appear to form recognizable shapes. The solar system consists of eight planets and host of asteroids, comets and meteors. A body revolving around another body is called a satellite. Moon is the natural satellite of the Earth. Some planets also have natural satellites. Venus is the brightest planet in the night sky. Jupiter is the largest planet of the solar system. The artificial satellites revolve around the Earth. They are much closer than the moon. Artificial satellites are used for weather forecasting, long distance communication and remote sensing. Question 1. 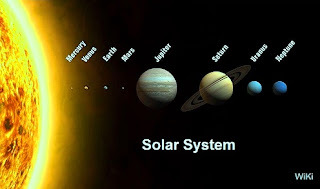 Which of the following is NOT a member of the solar system? Question 2. Which of the following is NOT a planet of the sun? (a) we can see only that part of the moon which reflects light towards us. (b) our distance from the moon keeps changing. (c) the shadow of the Earth covers only a part of moon’s surface. (d) the thickness of the moon’s atmosphere is not constant. Answer : (a) we can see only that part of the moon which reflects light towards us. 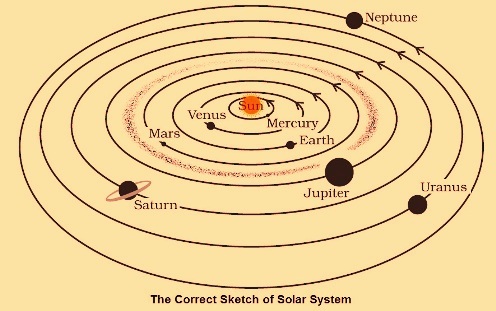 (a) The planet which is farthest from the Sun is ____________ . (b) The planet which appears reddish in colour is ____________ . (c) A group of stars that appear to form a pattern in the sky is known as a ____________ . (d) A celestial body that revolves around a planet is known as __________. (e) Shooting stars are actually not ____________. (f) Asteroids are found between the orbits of _________ and _________ . (a) The planet which is farthest from the Sun is Neptune . (b) The planet which appears reddish in colour is Mars . 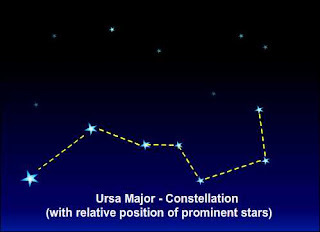 (c) A group of stars that appear to form a pattern in the sky is known as a Constellations . (d) A celestial body that revolves around a planet is known as satellite. (e) Shooting stars are actually not stars. 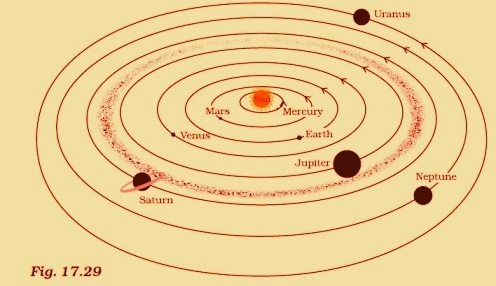 (f) Asteroids are found between the orbits of Mars and Jupiter . Question 7. In which part of the sky can you find Venus if it is visible as an evening star? Question 8. Name the largest planet of the solar system. Answer : Jupiter is the largest planet of the solar system. Question 9. What is a constellation? Name any two constellations. Question 11. Name two objects other than planets which are members of the solar system. Question 12. 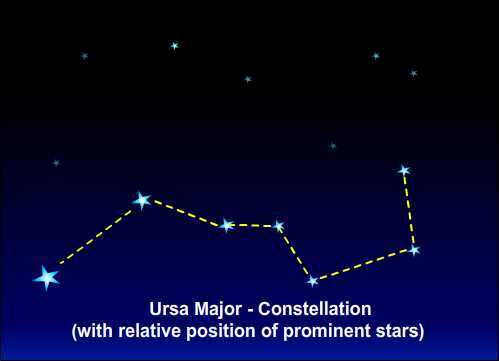 Explain how you can locate the Pole Star with the help of Ursa Major. Question 13. Do all the stars in the sky move? Explain. Answer : Yes, in real, all the stars in the sky move. As we know, all the celestial bodies comprising our solar system, Stars, Constellations and galaxies, are part of big Universe, which is ever expanding. Every celestial object with in Universe, in order to over come the gravitational pull of other celestial object around, has to move in some relative motion. 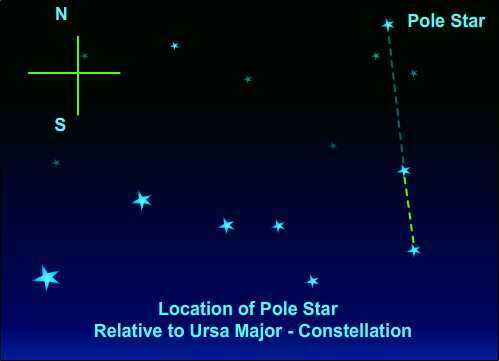 The pole star, which is also moving, but appears to be stationary from the Earth, because it is situated close to the direction of the axis of rotation of the Earth. From earth, all others stars appear to move from east to west as earth makes rotation from west to east around its axis. Question 14. Why is the distance between stars expressed in light years? What do you understand by the statement that a star is eight light years away from the Earth? Answer : The stars are located at far greater distance from each other.It is convenient to express distances of stars in light years. For example, The Sun is nearly 150,000,000 kilometres away from the Earth. Alpha Centauri, the next nearest star , is at a distance of about 40,000,000,000,000 km from the Earth. This distance is not convenient to express in normal units of length. To measure such large distances, we make use of another unit known as light year, which is the distance traveled by light, in one year with a speed of 300,000 km per second . So using this unit, the distance of Alpha Centauri is about 4.3 light years, which is very convenient to express. A star is eight light years away from the Earth implies that, for light, which travels with speed of 300,000 km per second, it takes 8 years to reach Earth. In other way, the distance between star and earth is around 9460800000000 km (365 X 24 X 60 X 60 X 3,00, 000 Km). Question 15. The radius of Jupiter is 11 times the radius of the Earth. Calculate the ratio of the volumes of Jupiter and the Earth. How many Earths can Jupiter accommodate? Question 16. Boojho made the following sketch (Fig. 17.29) of the solar system. Is the sketch correct? If not, correct it. thanx for helping students.it is free. the answer of 13 question is wrong. they appear to move because earth rotates from west to east.